Do we have a thread dedicated to contributions for our timeline? I think we should. July 2, 1976 he gave a reading in L.A. (place unspecified) according to the docu by Thomas Schmitt. I've just realized, that this actually IS in the timeline, only I had mistaken the 11 for a roman 2. Sorry. Go ahead and delete this! That's in the timeline but it's dated July 11 (I assume based on the picture of that marquee -- but the 11th looks like the show listed above it). Does the documentary specify the 2nd? That one's on there roni. Are you reading 11 as II (Roman Numerals)? Around the time, when he attended Virginia Road Elementary School he also lived on Virginia Road according to Neeli (who says this was just before they moved to Longwood Ave) and uncle Howie (who says that was 3 years after Trinity Street), so both of which point to 1927 without giving the exact date. I've never known you to be a contrarian. No, that would be me, unfortunately. Go ahead and delete this! No, you're right, it's a good thread to have. small thing: for his Hamburg-reading in 1978 the timeline gives only the month May. I notice on the poster it says Germany and not West-Germany. The wall came down in 1989. Maybe Roni can clear this up. I believe people in West Germany called their country Germany most of the time, or just the Bundesrepublik. It was probably just us non-Germans who called it West Germany most of the time, and when we called it Germany it was understood we meant West Germany since East Germany was a "closed country" we did'nt have much to do with, if anything at all. At least that's my take on it. I grew up in the 70s and 80s and really NO ONE would ever have used the word 'West-Deutschland' at all, except for written correspondence with other countries. It was clear, that WE were 'Deutschland' and that other land was 'die DDR' ('the GDR'). Typical. Acne Vulgaris sounds better doesn't it. Like a vulgar poem for a dirty poem. Well, I trust the leader of the dermatological hospital in Bremen, but I would wonder what he based his diagnosis on? [...] wonder what he based his diagnosis on? As far as I know, it seems mostly to tell from the phenomenons that Bukowski descripes. He (the dermatologist) seemed pretty firm when he talked about it. Btw, he himself (the dermatologist) never contradicted what Buk had said. Instead, he was calling it Acne Conclobata right from the start. I think it fits, given that 'Acne Vulgaris' sounds a bit like what Germans call a 'Verlegenheitsdiagnose', which means a vague diagnosis out of confusion or difficulty, when you're not sure, what it is exactly. Since back in the days he (Bukowski) received a mistreatment first, because the doctors didn't quite know, what to do - that is, when his own words about the matter were right - I find it believable, that the differentiation wasn't as elaborated then as it is now. So even though we don't have evidence in the form that we'd know the documents from the hospital, I do tend to believe in that more specific diagnosis, especially since, what I've found about it in the web fits pretty good. I think the Prof. might well be right. I looked up acne vulgaris and that's just normal acne (zits) than most teenagers get to some extent. Buk had a serious case of acne, so it probably wasn't acne vulgaris. He gives info about a lot of readings in that book even though most of them are vague. I don't usually add readings unless there's some specific date/venue information about them. I know the timeline only lists a fraction of the readings, but they are some of the most difficult things to verify. Not much information out there for some reason. [...]most difficult things to verify. Not much information out there for some reason. That's exactly why I thought of the timeline, when I reread about all those many many readings mentioned (with city etc) in 'Women'. Comparing the happenings in the book (which we know about, like in some cases what happened between him and the women etc) with the readings mentioned, I thought, we may add them to the timeline marked with a questionmark [?] behind them? I especially have reread the whole Pam-relationship in 'Women' and parallel reading in her own memoirs and it's always amazing to me, how much fits exactly (AND how much of which we know it's true is in there too). So maybe its worth giving it a shot? We would have to have either a date or venue for each one though. (the dermatologist) never contradicted what Buk had said. Instead, he was calling it Acne Conclobata right from the start. Acne Conglobata is the classification of a very severe and rarer form of the more common, (hence the name) Acne Vulgaris. 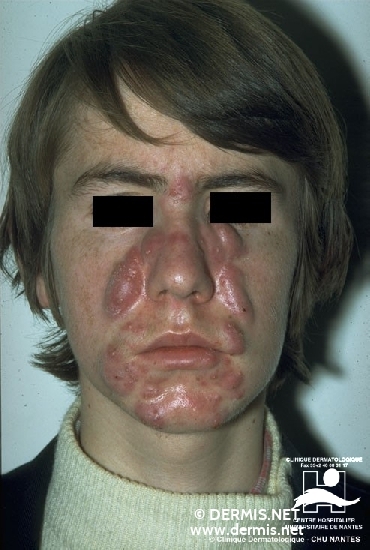 His diagnosis of Acne Vulgaris as described in Ham on Rye, when he is in 8th or 9th grade, at the hospitalt wasn't a misdiagnosis, just not totally specific. As to the treatment he received, well it was probably on a par with how everyone else was treated in the 1930's mostly with topical application of Benzoyl Peroxide, the 50's see the advent of antibiotics for the treatment of it, but it still today remains a pretty debilitating, extremely difficult ailment to manage. If you're volunteering to make a list, I'll add them. So, remind me again in, say, October. Please. Just reread Hanks letter to Burnett from 2-17-55, where he states, that right after his bleeding ulcer (which would be spring 1954) he worked as a truck-driver. Our timeline says, he was a mail-carrier from 1952 till March 1955 in one row. I don't really see a reason why he would lie to Burnett in that point. What do we make with that? According to his post office employment/payroll records he was promoted on April 1st, 1954, which would be just before he went in to the hospital. So when he came out of the hospital he certainly could have done some other job(s), but if that was the case, why did the post office then promote him again in March of 1955? What's odd about the timeline in 1954/55 is that everything seems to point to the hospital incident being in April 1955 - resigning from the post office in "ill health," working the non-post office jobs in the second half of 1955, etc. But we know from the letters and bills that the hospital stay was in 1954. So that mid-50s period has a few question marks. What makes the argument for the uninterrupted period at the post office is the promotions. Think about it; if you worked a job for a couple of years, then left just for the hell of it, then came back, would you be promoted after you came back? Maybe that's how the post office worked, I don't know. But if you left for medical reasons, I can see them "holding" your position for you until you came back. What could have happened is after the hospital Bukowski wanted to leave the post office, tried some other things (like driving a truck), and then figured that going back to the post office was easier since he was getting established there. But once he got back in he was disillusioned again, and quit (right after receiving a huge raise, interestingly). Speculation, I know, but it's all we've got unless there are more letters from that period waiting to surface.